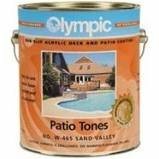 With Olympic Patio Tones deck and patio coating, you can give your pool and deck area a fresh, updated look. Just choose the right tone for your patio area, apply the easy to use formula, and enjoy as the deck coating breathes new life into your favorite outdoor area. The water based non-slip acrylic deck and patio coatings from Olympic provide much more than just an ordinary paint job, as they deeply penetrate concrete to provide a slip-resistant surface. These swimming pool coatings can even conceal damage when painted over pesky cracks or broken concrete. Plus, they are resistant to peeling and chipping for years. Olympic Patio Tones Swimming Pool Deck Paint is durable even under extreme weather conditions, and is an affordable solution for updating and improving safety around your swimming pool. To use patch and clean deck area, then roll Olympic deck paint over the wet deck surface. Two coats are required for bare concrete surfaces. Covers approximately 80 to 120 sq. ft. per gallon. Includes detailed painting instructions. If you have any questions about this product by Kelley Technical, contact us by completing and submitting the form below. If you are looking for a specif part number, please include it with your message.